Kagoshima’s Menya Sanji @Orchid Hotel (Singapore) | Get Your Grub On! A New Ramen In The Neighborhood! Today my ramen buddy and I went to checkout another new place that opened up in Singapore last year, Menya Sanji in Tanjong Pagar. When I’m in this area I’m always tempted to queue up at Keisuke for their delicious Black Oil Tonkotsu Ramen but today our mission was venturing for new tastes. My friend had their signature “Sanji Ramen” and naturally I went for the spicy version (pic). Both have the same pork base but mine had chili oil added to it. 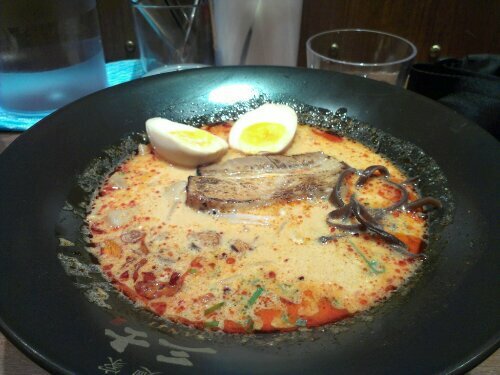 They also have a pork-chicken and even a pork-fish based ramen which I found a bit odd when screening the menu. The regular bowl was a bit blend and milky in taste so I was happy that my spicy ramen had a dram more depth and kick to it. The noodles were nice and chewy that next time I have to ask them if they make it themselves. We also ordered some extra eggs that were slightly overcooked and chashu which I would have wished to be leaner. Menya Sanji didn’t make it in my top 3 ramen places in Singapore but offers a solid bowl of Japanese goodness and the super friendly service and the substantial shorter wait compared to Keisuke around the corner will make some people jump the queue.